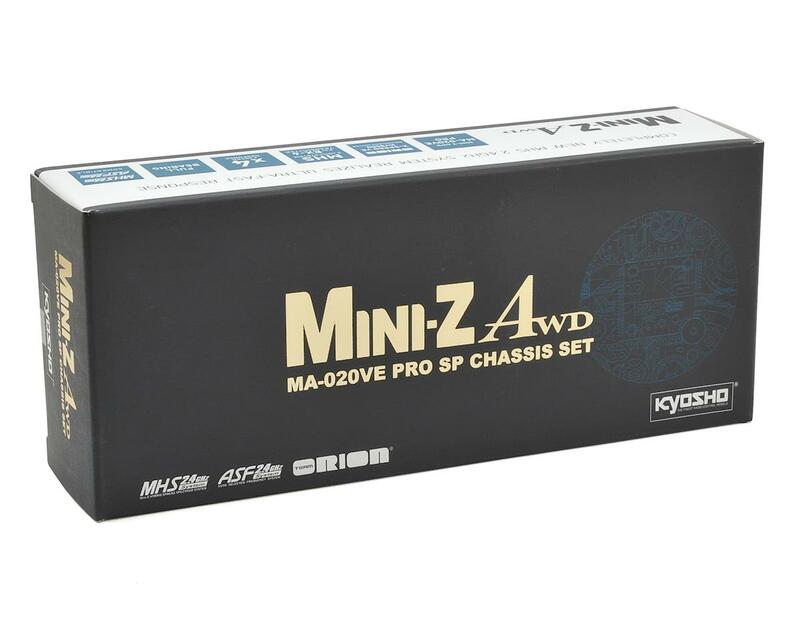 The Kyosho MA-020VE PRO SP combines MHS (MINI-Z Hybrid Spread Spectrum) and Xspeed VE brushless motor, with the awesome MA-020VE chassis and a variety of option parts to create a race ready SP chassis set. Loaded with the lightning fast 8500KV Xspeed VE brushless motor, an aluminum motor sleeve and motor cover to control heat and extract every drop of power from the brushless motor, the SP is the fastest MINI-Z in history. The motor sleeve and motor cover are anodized in the premium "SP" color, while the normally grey main chassis is anodized black. The SP chassis set also includes a gyro unit set as standard. Packed with high-performance optional parts, the MA-020VE PRO SP Chassis Set is a base chassis built for racing. NOTE: Requires a transmitter compatible with the MHS Mini-Z HYBRID SPREAD SYSTEM, like the KT-18 and KO PROPO EX-1. 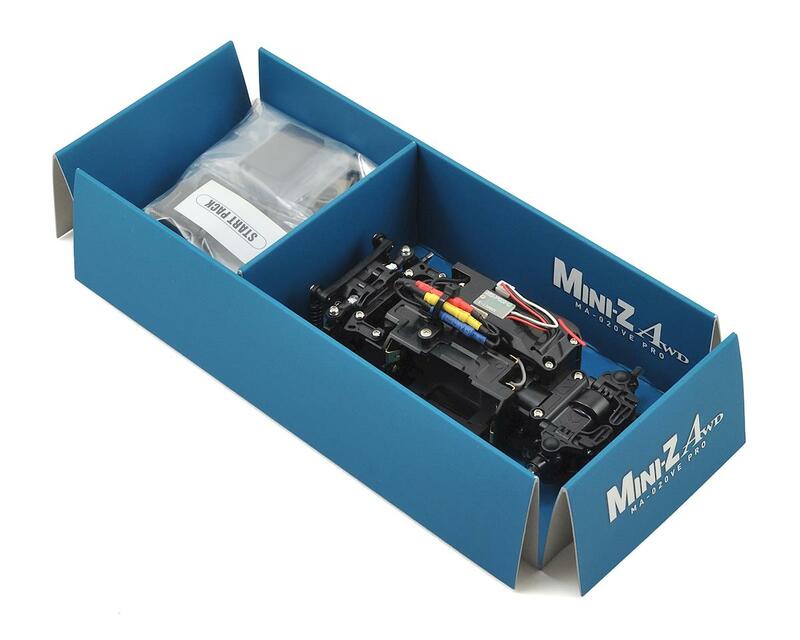 MA-020VE PRO features brushless motor with previously optional cooling system. SP chassis specifications are identifiable with the special red anodized motor sleeve and hard anodized motor cover. Main chassis is finished in formidable black. Includes optional gyro unit set as standard. Nickel plated hex screws are used on all main sections. Features the MHS2.4GHz system with the fastest response speed in MINI-Z history. Compatible with ASF2.4GHz systems. *Transmitter is sold separately. Incorporates the "VCS" front suspension from the MR-03. Double wishbone suspension (DWS) equipped on rear. Full ball bearing specifications include a total of 14 precision ball bearings. Equipped with wide rear suspension arms. Aluminum motor holder set II (#1 / #2) produces excellent heat dissipation and rigidity. Special hard anodized specification for the SP chassis. Powerful Xspeed VE brushless motor boasts 8500KV with limited specification red anodized aluminum motor sleeve as standard. 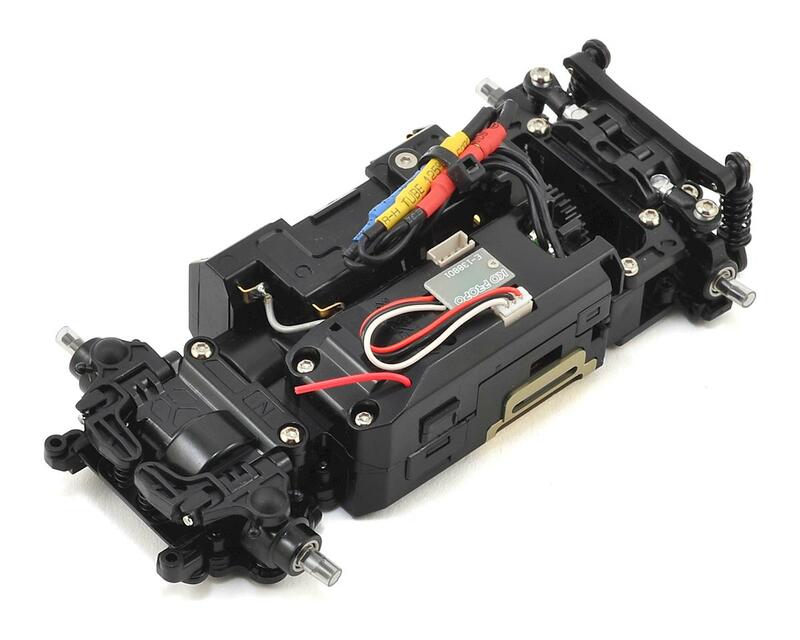 SP Chassis also includes hard anodized aluminum motor cover that controls heat to extract full power from the brushless motor.